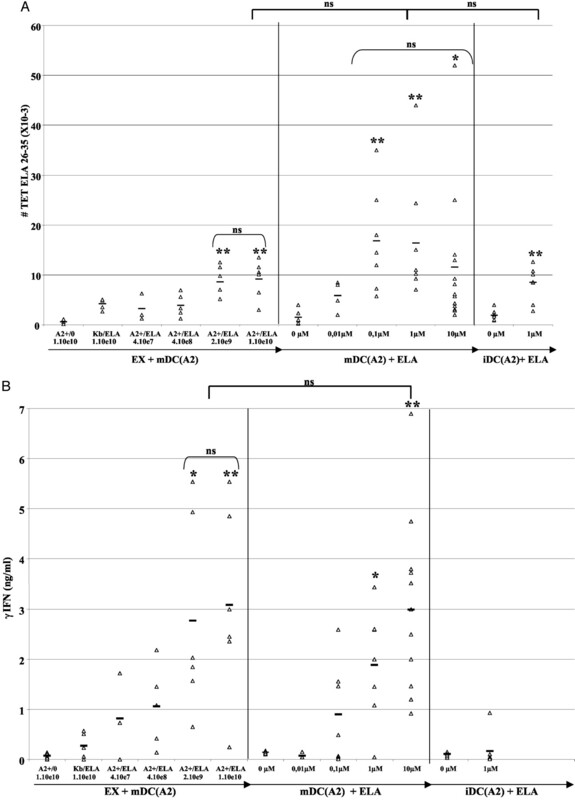 Legend continues Exosomes mimick the effects of mDC in the initiation of CTL responses specific for synthetic peptides. Immunizations were performed with various peptide-based vaccines. Same experimental setting than in Fig. 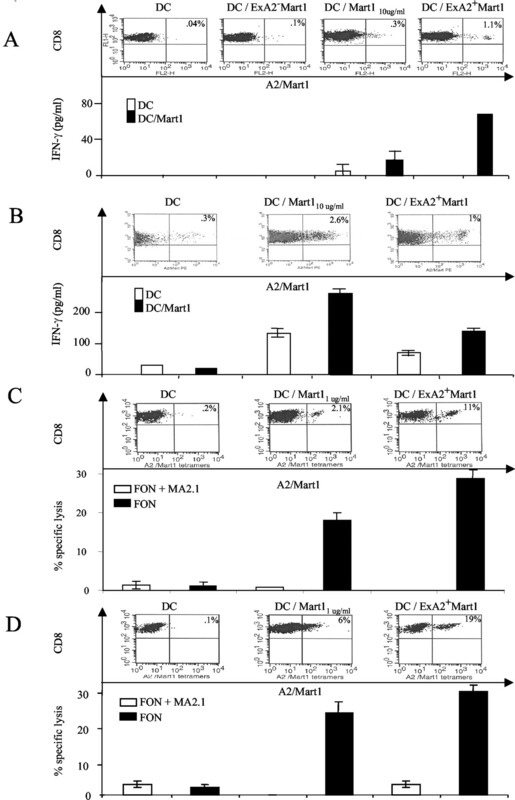 5 using either: 1) 3 × 105 immature HHD2 BM-DC (iDC), or 2) LPS-matured BM-DC (mDC) pulsed with grading doses of Mart126–35 peptides (ELA), or 3) grading dosages of exosomes pulsed onto 3 × 105 mature HHD2 BM-DC. 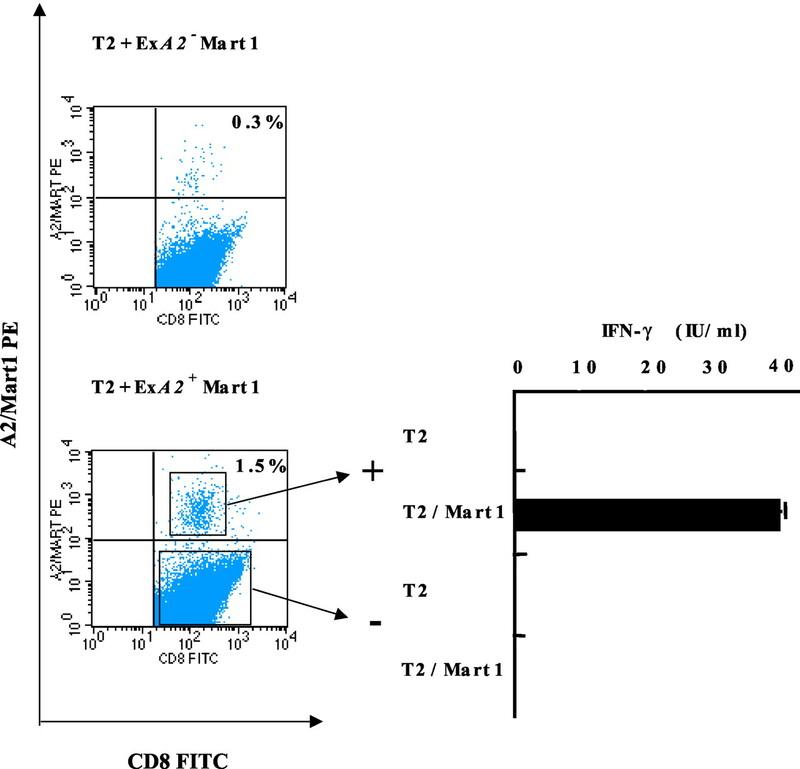 A, Depicts absolute numbers of CD3+/CD8+ lymphocytes of the draining LN staining with A2/Mart1-specific tetramers, while B shows Mart1-dependent IFN-γ secretion of LN mononuclear cells challenged with 10 μM of Mart1 peptides in 48-h in vitro cultures. Each dot represents data obtained from one mouse. 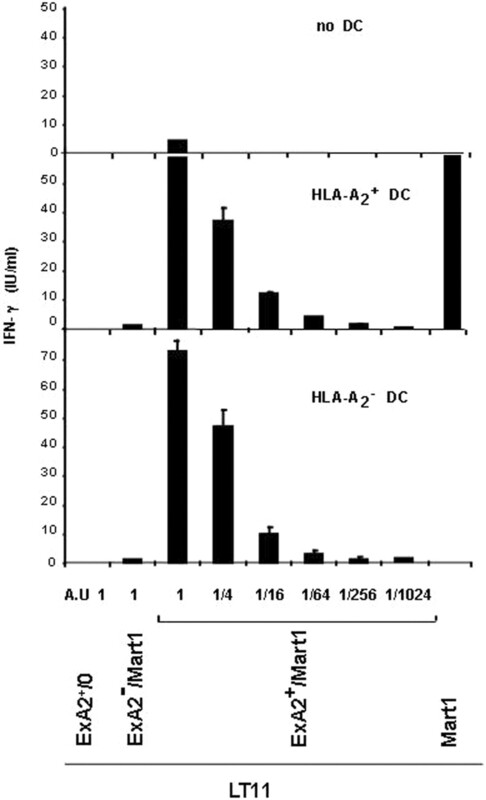 The staining achieved with the irrelevant tetramer (A2/HIVgag) on relevant nodes represents the background numbers of tetramer-positive lymphocytes; data not shown in the figure (the mean ± SEM percentage of tetramer staining with A2/gag HIV on relevant nodes (n = 20) was 0.16 ± 0.13, representing absolute numbers of 437 ± 250 cells). Each panel depicts the data relevant for three independent experiments. ∗, Indicates statistically significant differences at 0.05 confidence interval (and ∗∗ at 0.01) using Fisher’s exact method. ns, Not significant at 5% confidence interval.